Vicious are the epitome of what a heavy metal band should be, fun, loud, and proud. Their new record First Drop Of Venom is ten tracks of high energy hard rock that will get you bopping around the clock. These songs, while not as polished as they could be, have a wonderful youthful exuberance to them that proves the rock and roll magic of Vicious. This is more than just a band, this is a movement. 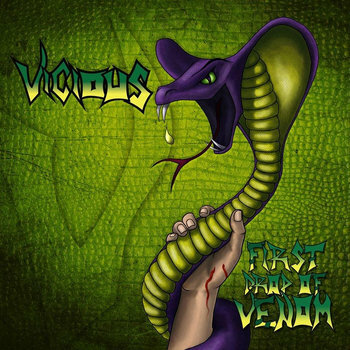 They stand for something greater than themselves, Vicious is proof that the music of the 80's will never die, but always live on in the guitars, drums, and voices of young men with big hair. These grooves will immediately catch your ear and get you dancing to the eternal magic that seems to be encapsulated in the Vicious sound. Now, while they still need to take the time to evolve and get a tighter sound, First Drop Of Venom is more than sufficient for now. Definitely worth repeated listens let these riffs work their way into your heart!